The primary source is the historian’s most prized asset. However, sources taken on their own are not necessarily interesting; it is how the researcher can see in them and through them, placing them in context to piece together historical narrative, that makes them intriguing. When used effectively, sources can truly be windows into history, and—like windows—they can be clear, dirty, foggy, even distorted and deceptive. Political cartoons are an example of a relatively easy-to-see-through window, albeit one where apparent clarity can be deceptive. Since they are political by nature and are generally created to prop up one side of an issue, political cartoons have biases and distortions baked-in from the outset. Consider a relatively well-known cartoon by Victorian cartoonist and illustrator John Tenniel. “Dropping the Pilot” (figure 1) appeared in the British humor magazine Punch in March 1890.1 The subject of the cartoon was a huge event in 1890 (and possibly still recognizable to modern viewers knowledgeable in German history): Otto von Bismarck’s ill-advised resignation as Chancellor of the German Reich at the request of Kaiser Wilhelm II. Bismarck is Palinurus, brilliant navigator for the hero Aeneas; he is immune to the hypnotic effects of the Lethe, the River of Forgetting that flows through Hades. From image to laudatory poem, it is very clear how Tenniel and his editors at Punch felt about his resignation in 1890. However, it would be a mistake to take the image as the whole story. For one, in presenting this simple scene of a mariner leaving his ship, it belies a complicated set of political machinations and the set of warring factions that finally led to the resignation. In brief, it was a tale of old versus new in policies as well as attitudes. The pictured Kaiser Wilhelm II took the throne of the German Reich in 1888.3 He cared little about the accomplishments of Bismarck and the previous Kaiser Wilhelm I in unifying the German states.4 To Wilhelm II’s generation a unified Germany was a given. They had never known any other setting, and treated unification as a jumping-off point for further conquest.5 Wilhelm II and Bismarck butted heads on this issue and others related to the governance of Germany until Bismarck finally made a political blunder and resigned in 1890.6 He was no passive player in his resignation and his ouster was not simply a case of a superior dismissing a powerless subordinate as the cartoon suggests. A wink of the eye, “I’m prospecting! Unlike the fallen Bismarck of 1890, the Bismarck of 1885 is someone to be watched and “checked” by the other countries of Europe. He is Thackeray’s Billee, shimmying up yardarms to spy new lands and save his own skin.9 He is a perverse Germanic caricature of John Bull, the rotund English everyman and longstanding avatar for the British national character.10 He is anything but noble. 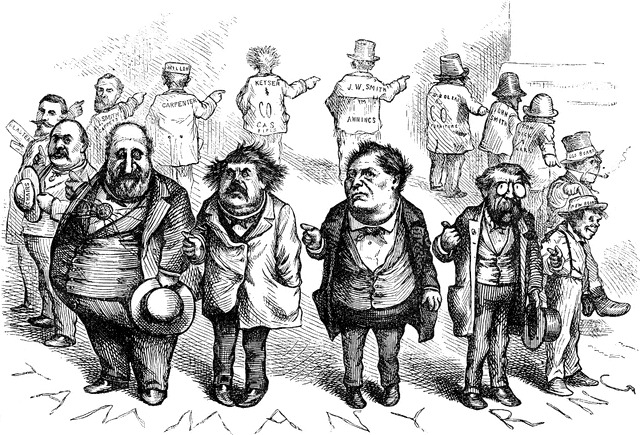 These two examples show the strengths and weaknesses of political cartoons as primary sources. The best ones show prevailing contemporary attitudes more lucidly than any other sources. However, the researcher must hold in mind that they are simplifications by nature, subject to the fluidity of prevailing opinions and always motivated by ulterior political motive. John Tenniel, “Dropping the Pilot,” Punch 98, March 29, 1890, 150 – 151. 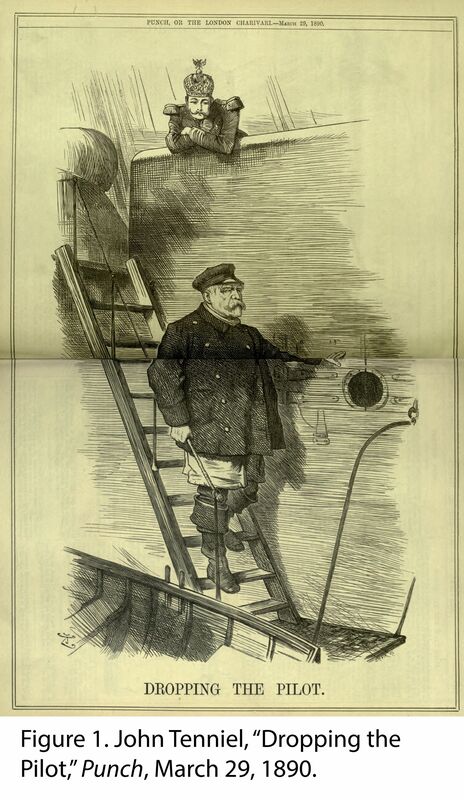 “Dropping the Pilot,” Punch 98, March 29, 1890, 155. Charlotte Sempell, Otto von Bismarck (New York: Twayne Publishers, Inc., 1972), 166-168. Alfred Apsler, Iron Chancellor: Otto von Bismarck (Folkestone: Bailey Brothers and Swinfen Ltd., 1968), 163-164. “Chancellor No Longer,” New York Times, March 19, 1890. 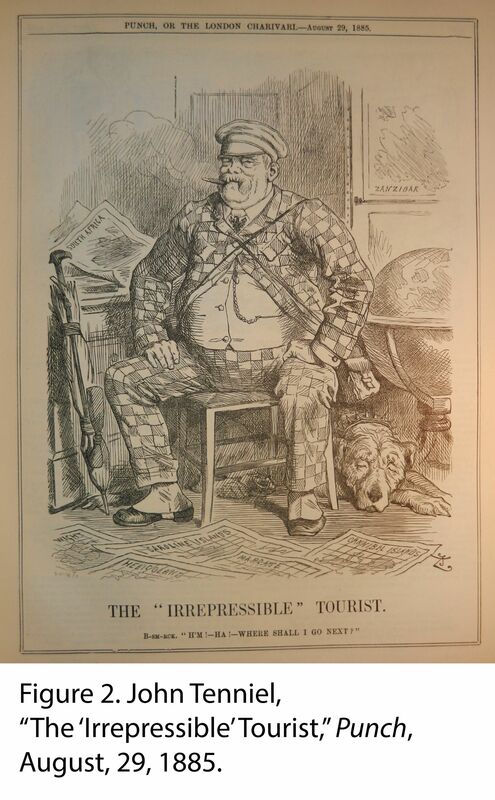 John Tenniel, “The ‘Irrepressible’ Tourist,” Punch 89, August 29, 1885, 103. “The Irrepressible Tourist,” Punch 89, August 29 1885, 102. William Makepeace Thackeray, “Little Billee,” in The World’s Best Poetry, ed. by Bliss Carman, et al. (Philadelphia: John D. Morris & Co., 1904); Bartleby.com, 2012, https://www.bartleby.com/360/9/84.html. Tamara L. Hunt, Defining John Bull: Political Caricature and National Identity in Late Georgian England (Aldershot, Hampshire, England; Burlington, VT: Ashgate), 2003.